Drawer Slides Replacements 300mm Brown plastic Push-in style from Furnacc. Designed to fit into 4 locating drill holes on the inside of cabinets. Locating lug positions are very specific to this fitting. Sold in pairs of Left Hand and Right Hand. Quantity break for 6 pair. 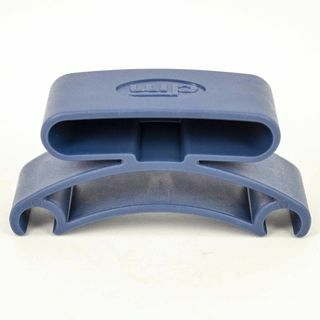 Replacement lightweight plastic push-in style drawer runner. Colour Brown. Four (4) lugs locate into pre-drilled holes on the inside facing of lowboys, chests of drawers and simular furniture items. Overall length is 300mm. Plastic lugs are 8mm diameter and thickness of runner is 7mm. Locating lugs are very specifc for existing furniture items and are shown against a ruler in the main image. A heavier weight version DR295WH is also available.